Finding out how much do Beagles cost can depend on where you’re looking. Beagle puppies will generally cost between $350 and $1200 when bought from reputable breeders. However, rescuing a Beagle from a shelter often reduces the prices. But this is just the initial cost. Raising puppies will involve extra expenses. Beagle prices are essential to know if you’re hoping to welcome a Beagle into your family. You can find out about choosing and looking after a Beagle puppy in our informative article at this link. But in this guide, we’ll be looking specifically at how much do Beagles cost to buy and raise. Many would-be Beagle puppy owners choose a breeder purely based on the price of the puppies that they sell. When asking ‘How much do Beagles cost?’ surely the cheaper the better? After all, a puppy is just a puppy, and any breeder charging very high rates must be merely out to make a fat profit, right? Reputable breeders don’t breed puppies just to make a profit. In fact, the cost of the puppies breeders sell reflects the pups’ quality and good health, and the high rearing standards of the breeder. In the world of puppy breeding, the old saying, “You get what you pay for,” definitely applies. Also, Beagle puppy prices can vary between states and regions. But that’s because vets fees, feed supplies, etc., are more expensive in some areas than in others. These costs will affect the pups’ breeder. So, if you’re still unsure how this can affect how much Beagles cost, let’s take a closer look. What costs are incurred by Beagle breeders? Stud fees: Not all breeders own a stud dog. Therefore, they will need to pay for a stud animal’s services, and prices can run into hundreds of dollars. Living expenses: Just like people, dogs need somewhere to live! A breeder will need suitable housing for parents and puppies. The kennels must also be cleaned, heated, and lit, all of which costs money. Health screening: Beagles are prone to several health conditions that they can inherit. This includes hip dysplasia, canine epilepsy, Musladin-Lueke Syndrome (MSL), Steroid Responsive Meningitis (SRM), and Factor VII deficiency, which causes blood clotting problems. Responsible breeders have breeding stock and puppies screened to highlight any of these problems, at the cost of up to $1,000 in some cases. Vaccinations, etc. : New puppies need health checks and vaccinations before they can go to a new home. Add to that de-worming costs, and the bill can run into hundreds of dollars per litter of Beagle pups. Veterinary fees: No matter how well-cared-for a breeder’s dogs are, things do go wrong sometimes, leading to vet’s fees. A complicated pregnancy and Cesarean section birth can cost thousands of dollars. Food: All the breeder’s dogs, including new puppies, need to be fed! Add to that the cost of vitamin and mineral supplements and the bill could be a hundred dollars a month or more. Although this depends on how many dogs the breeder has. Breed society registration fees: Most breeders like to register their puppies with the relevant breed society to justify the value of the pups and to verify their pure-bred status. Registration costs depend on each organization, ranging from $2 to upwards of $25. Microchipping: It’s crucial to microchip all dogs so that they can be reunited with their owners if the animal is lost or stolen. Microchipping costs around $50 per puppy. Miscellaneous: Finally, all the breeder’s dogs will need bedding, food and water bowls, collars, harnesses, leashes, and toys. The cost of all this can add up to several hundred dollars, depending on how many dogs a breeder owns. So that’s why Beagle puppies can be so expensive! You can buy cheaper puppies. But in the next section of this article, we discuss why you should be very wary of doing so. We recommend that you always buy any puppy from a registered, reputable breeder. You’ll find a list of Beagle breeders on the National Beagle Club of America website at this link. You can expect to pay a high price for a well-bred Beagle puppy from a breeder. Puppy mills exist purely to allow unprincipled individuals to cash in on current trends by producing hundreds of desirable breed puppies as quickly and cheaply as possible. That usually means that dogs live in awful conditions without the most basic comforts. Often, puppies are unvaccinated and sold with diseases that can quickly prove fatal. Be warned: many low-rent pet stores obtain their puppies from puppy mills. It’s all about making a buck at the expense of both the parent’s and the puppy’s welfare. So, how do you spot a puppy farm? Read our article at this link to find out. If you’re happy to give a home to an unwanted Beagle, you might want to check out some of the many Beagle rescue centers that exist. The shelter may take references for you and inspect your home before you’re allowed to adopt one of the rescued Beagles. How Much do Beagles Cost from Shelters? You can’t buy a dog from a rescue shelter. But you can make a donation to go toward the center’s daily expenses. Pet adoption usually ranges from $350 to $550. It’s worth noting that the adoption fee also includes registrations, vaccinations, a health check, and de-worming treatment. By adopting a Beagle, you’ll save money. Better yet, you’ll be providing a wonderful forever home for a Beagle who needs one. What Is The Cost Of A Beagle Puppy? So, how much do Beagles cost at the moment? 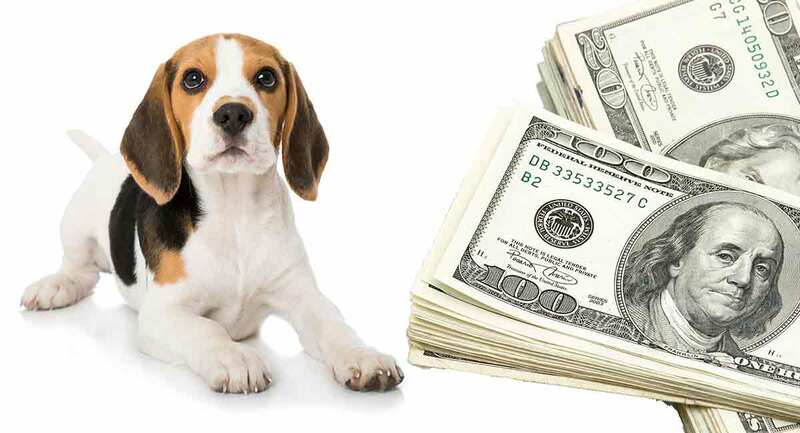 In the current market, the cost of a Beagle puppy from a licensed, reputable dealer is between $350 and $1,200. Of course, it depends on whether the pup is Kennel Club registered and of show quality. Puppies from particularly well-bred parents can fetch several thousand dollars! Are There Other Costs With A Beagle Puppy? If you’ve owned a dog before, you’ll already be familiar with the other costs involved! child/dog gates to keep your puppy contained where you want him to be. You can see that you’ll need to save up before you can even think about buying a Beagle puppy! All these essential items will quickly add up to at least $300! So it can be quite hard to predict exactly how much do Beagles cost when you consider all of this! If you’re asking yourself how much do Beagles cost, you’ll need to remember the extra expenses. One of your main ongoing expenses will be food for your Beagle puppy. Although Beagles are generally laid-back characters, they are bred to be hunting dogs, and they do need daily exercise. When your Beagle is a puppy, he will burn lots of calories every day through play. You also need to feed your puppy to support his growth and healthy development. Older Beagles do not generally require as much food as younger animals, and overfeeding can actually lead to obesity and associated health problems. All dog food rations are based on the dog’s body weight. For Beagles weighing 13 to 20 pounds, the recommended daily feeding regimen is one to one and a half cups of dry food. Larger Beagles should be fed up to two cups of dry kibble each day. So, based on the average cost of a large bag of dry dog food, feeding a Beagle for a month would cost you around $55. If you’re not sure how much to feed your Beagle, ask your vet clinic for advice or contact the free nutrition advice line of any of the major pet food manufacturers. In summary, the answer to, “How much do Beagles cost?” depends on several factors, including where you buy your puppy. Always buy a puppy from a registered dealer, even though that will be more expensive. Cheap Beagle puppies could come from a puppy mill where they are kept in appalling conditions and are not vaccinated, or health checked. When you’re calculating a budget for your new puppy, keep in mind that you will also have to pay for all the gear he’s going to need from the moment you get him home. Also, your new canine companion will require regular visits to the vet for the whole of his life. If you own a Beagle, we’d love to know about him! Where did you buy your Beagle puppy? Or have you encountered a puppy mill during your search for your perfect pup? Tell us your Beagle’s story in the comments box below! Bader et al. 2010. An ADAMTSL2 Founder Mutation Causes Musladin-Lueke Syndrome, a Heritable Disorder of Beagle Dogs. PLOS One. Tipold and Jaggy. 1994. Steroid-responsive meningitis‐arteritis in dogs: Long‐term study of 32 cases. Journal of Small Animal Practice.